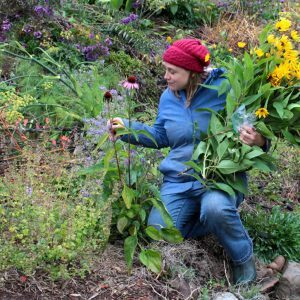 I am returning to Galiano Island to harvest an entire meal out of the Galiano Community Food Forest that will be prepared by five star chef Jesse McCleery at Pilgrimme restaurant. But what are we going to find in the winter? We sail away from Vancouver with snow capped mountains behind us all up and down the coast. In the ferry, the forward lounge is full of sunlight off the ocean. As we make our way across the Georgia Strait toward Galiano Island, we spot a pod of killer whales off the starboard side, their exhales in the cold winter morning sending spouts above the waves. 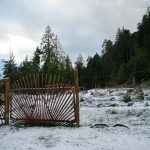 I am returning to the Galiano Community Food Forest at what feels like an odd time of year. 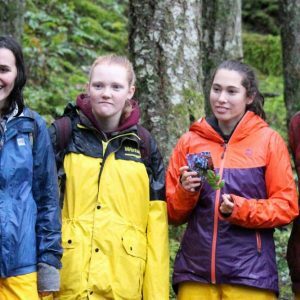 Are we really going to eat an entire meal out the forest in the middle of winter? 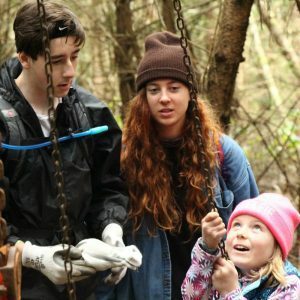 The Galiano Community Food Forest is now in its second year, an early age for a project with a 300-year planning horizon. 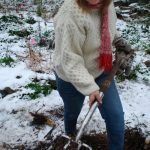 The Food Forest is a ‘forest garden’ of food bearing trees, shrubs and understory plants that are grown together in a single integrated ecosystem. 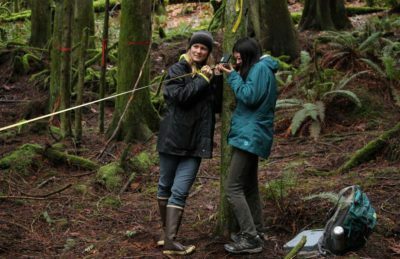 The forest is designed to be a source of local food that is resilient to the changing climate. Just like natural forests, it cycles nutrients back in to the soil and creates its own micro-climates that shelter the more venerable plants. The food forest is also designed to be an educational space that connects people with their food in a beautiful and abundant setting. Even early on, the Food Forest is attracting people from all over BC who are keen to learn about how to replicate this model in their own back yards and communities. The ferry docks in Sturdies Bay and walking on to Galiano island, I am struck with the quiet peace that seems to change the experience of time here. 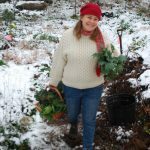 I am going to meet food forester Cedana Bourne who runs the food forest for the Galiano Conservancy Association in a few hours to see what we can find to eat under the snow. The hours pass easily and walking around in the sunshine is a wonderfully rich experience. I am reminded of the sounds I can’t hear in the city. 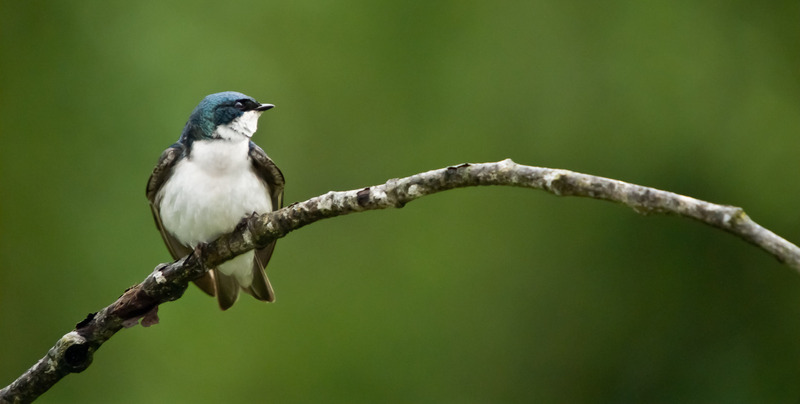 Wind in the trees, the audible swish of raven wings, and the twittering of eagles. From Bellhouse park, I can see the standing waves in Active Pass, a testament to the power of the tide moving through. I call Pilgrimme restaurant and to my surprise Jesse himself answers the phone. I tell him I’m about to head to the food forest and he says he’d like to join us for harvesting. As a proponent of the ‘locally sourced’ and ‘farm to table’ culture it is a truly special experience to be harvesting with Pilgrimme’s five-star chef in a snowy food forest for the ingredients of my dinner. It is soon time to meet Cedana and we drive up island. Away from the cute restaurants and little café in the south end and into an expanse of forest, snow frosted trees on either side of the road. 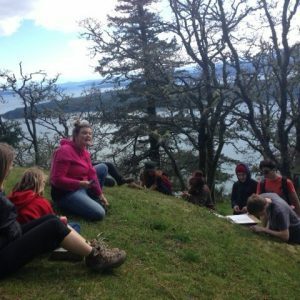 We are going to the Millard Learning Centre, a property owned by the Galiano Conservancy where they host workshops and educational groups and do inspiring restoration work on 188 acres of protected land. It is here, on a sunny plateau, that the Food Forest grows. We walk in on a snowy forest road, past towering old growth fir trees and brilliant red of gangly arbutus that still have their leaves. As we approach, we can see the massive cedar fence posts and the brilliant gate with its design that radiates outward, an homage to the sun. The entire site is a work of art. Natural builder Erik Wilkinson has used local wood and salvage lumber from the site to build the gates and trellises of the food forest. 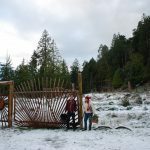 Marvin Wilson, a local first nations artist, won an art contest put on this summer by the Galiano Conservancy and is in the process of creating a large-scale carving to go over the entryway. Cedana is already there, hard at work finding food for our dinner. Her intimate knowledge of the forest is absolutely essential for knowing where things are under the snow. I can see that the harvest baskets are already full of interesting plants. 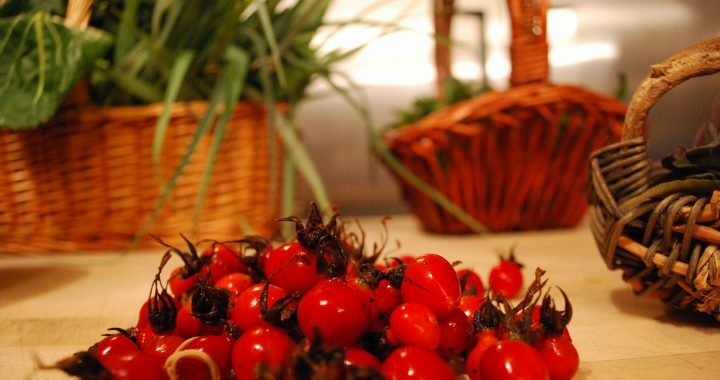 Amazingly enough, there is an abundance of food to be harvested in middle of winter. Cedana shows us where she has been digging up sunchokes from one of the many massive raised beds. Almost immediately Jesse is right in there with her collecting the tasty little tubers. 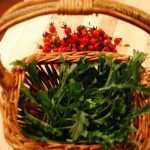 We tour the forest and gather dikon radishes, rose hips, Brussels sprouts, leeks and hardy winter greens like red Russian kale, cabbage and oxeye daisy. We will supplement the food forest food with flourishes from the Millard Centre greenhouse such as radicchio, pak choi, and nasturtium flowers and leaves. 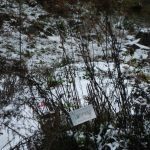 We are lucky that the day is bright and, while the snow makes finding things challenging, it is beautiful to be in the food forest. 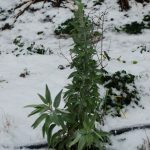 While the winter slows the growth of these plants, we are reminded that, both above and below the ground, there is still an abundance of life. Hardy greens like kale continue to grow, making gains mostly on days above 4 degrees. 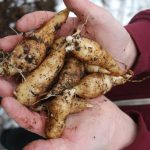 Roots like radishes and sunchokes get sweeter with the cold as they concentrate sugars that they will use to grow again in the spring. 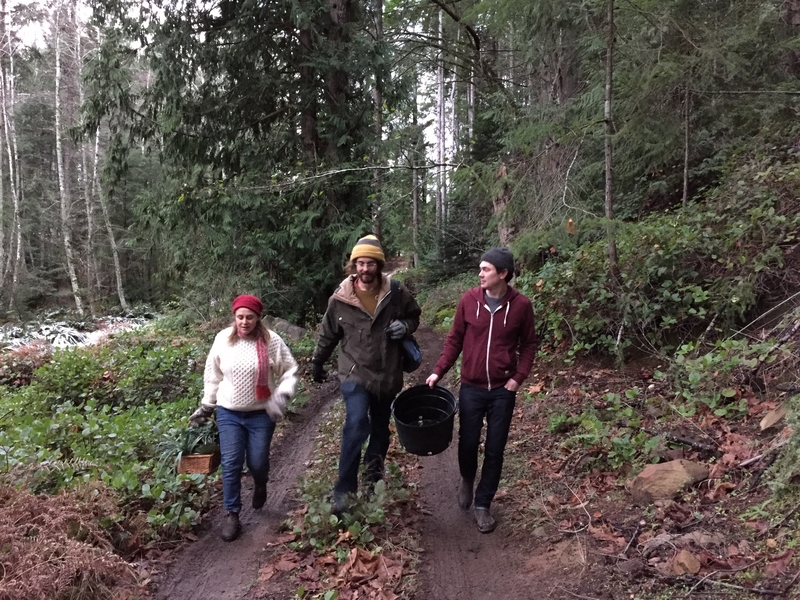 By the time we leave the food forest we have several baskets full of vegetables, greens and tubers, more than enough for Jesse to create an incredible meal out of. As the afternoon light fades, we transition from the expansive forests at the Millard Centre to the cozy rustic charm of Pilgrimme restaurant. Just before dusk, we are outside and Jesse is firing up his ceramic kamado barbeque. Here he will slow grill the sunchokes. Inside, I can see that the fascinating jars of ferments and pickles have changed with the season. After being poured a crisp glass of Wolf Vine wet hopped pale ale by Hoyne, we are put to work preparing plants to be cooked. 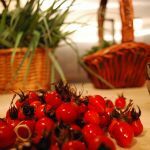 Cedana is expertly pitting rose hips while I am cutting open Kukai pumpkins, a job for which I wish I had an axe, instead of a kitchen knife. We get to try the first dish while we’re all still gathered in the kitchen. 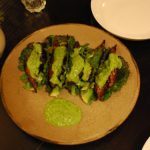 Sunchoke tacos cooked over coals in ‘tortillas’ of grilled cabbage with a sauce made of blended arugula, nasturtium and roasted Kukai pumpkin seeds. The tacos are sprinkled with edible flowers. The sunchokes are surprisingly creamy and the cabbage ‘tortilla’ is crisp and light. The sauce is bright and alive upfront, with an earthy finish that comes from the roasted seeds. We are now seated in the restaurant at a big table and Jesse brings out the second dish. Next up is a salad of greenhouse greens and daikon radish from the food forest in a wild fermented apple cider vinegar topped with a powder made of dried apple and rose hips, all from the food forest. Mustard greens, oxeye daisy, pak choi, pea shoots and radicchio. The daikon has an almost wasabi like heat. Cedana tells me that the radish provides edible pods and roots and is also a self sowing annual. The dish is an adventure overland with refreshing peaks of bitter and valleys of spice and earth. Our last course is charred whole leaks sprinkled with nasturtium, with a sauce made from pumpkin seeds, nasturtium and organic cold pressed canola. The leeks have a soft core and the charred outer leaves explode with a roasty flavour. The charred leeks, in the onion and garlic family, have an allium taste that is almost reminiscent of onion rings. Imagine onion rings that are healthy and organic with a depth of flavour and artistic flourish. As we end our meal, we are served a tea made from arbutus bark and rose hips with a hint of wild flower. The tea is the colour of rooibos but has a completely distinct taste, floral and slightly bitter. With the meal complete, Jesse joins us for some tea and conversation. 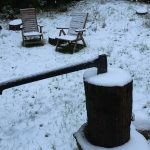 This day of incredible food, of foraging under the snow, sunshine and orca whales, is followed by an evening catching up with friends around a glowing woodstove. In the flickering light I reflect on my day. 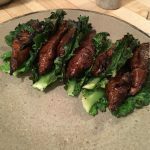 The experience of this meal, with food that comes from the earth is a reminder of how food can be closer to the forces of nature, and how it draws its energy and vitality from them. There is a sense of direct connection in everything I have done today. From the simple sounds of the living natural world to the smell of the turned earth and snow to the sunlight off the ocean, I feel my senses have opened up to take it all in. Perhaps this is why time seems to move differently here.